Our mission is to provide you with professional workout equipment and extraordinary service. We design to offer customers the highest quality and highest cost performance so that you can enjoy workout . DO NOT fill filler bags beyond 3/4 full. Or it may increase the rate of sand leaking. The most suitable working weight for this sandbag is approx 40 lbs. And it will be a bit empty, the sand inside will not shift much in the bag. EXCELLENT DURABILITY: The outer bag and filler bags are made of ultra-tough nylon cordura and pieced together using strong nylon stitching, which brings unmatched durability. EASILY GRIP HANDLES: 6 handles allow you to develop multiple training ways and creat versatility and flexibility in your workout. The easily grip handles allow you to quickly find center of gravity and adapt to your training without distraction. ADJUSTABLE WEIGHT: The maximum capacity of each pack is 8 lbs. You can easily adjust your fitness weight by adding or removing the filler bags. 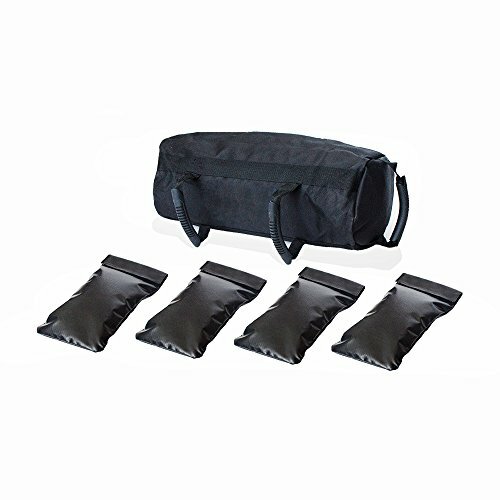 ULTIMATE ATHLETES TOOL- Both men and women can use this sandbag for adjustable weighted exercises. Especially designed for female and startup trainer.Heavy jumping, lifting, running for exercising arms, legs and waist. NO SAND: This fitness sandbag DOES NOT INCLUDE SAND! The outer bag has a high quality zipper, and the filler bags have double-sealed inner liners fitted. Double protection, no leakage! If you have any questions about this product by Newdoar, contact us by completing and submitting the form below. If you are looking for a specif part number, please include it with your message. Resistance Band Set Workout Bands - Professional Quality Set of 15 Pieces - Carrying Bag, Door Anchor, Handles, Ankle Strap for Legs Workout, Resistance Bands, Loop Bands. Exercise Chart Included.